TestFont_MFC_Native is a VC++ (MFC) project that demonstrates the integration of the ConnectCode DLL with VC++ . The source code for TestFont_MFC_Native is provided in the download below and requires Visual Studio 2003 or later to compile. For the barcodes to be properly displayed, the trial version of ConnectCode Barcode Font Pack has to be installed . Download the TestFont_MFC_Native.zip executable and source code. Note : For Visual Studio 2010, please refer to the sample bundled with the ConnectCode Barcode Fonts download. 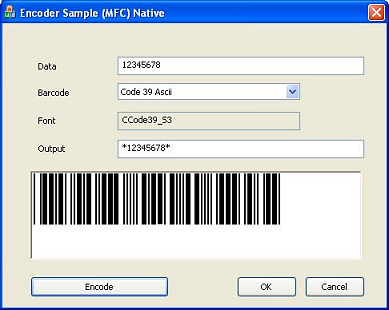 The ConnectCode Barcode Fonts DLL and the source for the TestFont_MFC_Native sample are free to use and can be compiled and distributed with users' applications as long as they are being used with any one of the registered barcode font packs. Redistribution of ConnectCode's fonts will, however, require a Distribution or Unlimited Distribution License. 1) To integrate the dll into your VC++ project, you will need to include the header file connectcodefont.h and link with connectcodefont.lib. These two files can be found in the compressed package TestFont_MFC_Native.zip. The result will be placed in the outputbuf buffer. The TestFont_MFC_Native sample includes all the above steps in a short and easy to understand program.